After the amazingly successful 1973-74 season, the Saginaw Gears suffered the common ill of a minor league team that made it to the finals, they lost a lot of players. Mike Hornby, Rejean Beaudion, Jerome Engele, Lowell Ostlund were among those who departed. The loss was not just of names, but it was one of size, strength and toughness. To start the 1974-75 season, the Gears sought out new names new size and new muscle. Among the new muscle that was added to the Gears lineup came a young, tough kid straight out of Junior A in Quebec. At the age of 20, Kurt Walker put on the #6 jersey formerly worn by Jerome Engele and instantly became, not only a professional hockey player, but a fan favorite in Saginaw. Anyone who took any interest at all in Gears hockey that season quickly saw that Kurt’s fists moved as quickly as his skates, and that was exactly what Don Perry and the Saginaw Gears were looking for. When the Gears came to town, Perry wanted other teams to know they were in for a rough night. Likewise, he wanted opposing teams who came to Wendler Arena to not be looking forward to their visit. Saginaw required some enforcers, and Kurt Walker fit the bill nicely. Kurt was only in Saginaw for one season, but he made it all the way to the Toronto Maple Leafs and the NHL there after. He has been gracious enough grant Saginaw Gears Dot Com the chance to interview him and become a part of our web site. SGDC: Kurt, welcome to Saginaw Gears dot com. You still have a lot of fans in the Saginaw area, so I’ll go ahead and start by asking what is probably their number one question; what are you doing these days? KURT: After I was traded to the Los Angles Kings it was as though my world had come to an end. 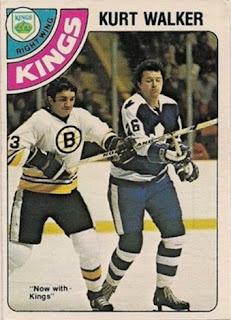 To go from hockey's premier city Toronto to then the struggling Kings was very difficult for me. I had just signed a 3 year deal with Toronto and I knew LA had no plans for me in their organization, it was the beginning of the end for me. So after 2 years I decided to hang them up in 1981. With no college education I realized the transition to the "real world" was going to be a difficult one. I had spent several summers in the Atlanta area with some of the original Atlanta Flames, players Richard Mulhern, Tom Lysiak were friends of mine so I decided to move to Atlanta. For the next two years I bounced around in search of what the next chapter in my life was going to be. I was tending bar one night when a man walked in with 3 attractive women, I had closed the bar but he wanted to have dinner, since the place was closed I decided to cook for them. I sat and had dinner with them and learned about his company, he was an independent labor contractor who provided personalized labor services for companies that attended tradeshows coast to coast. That was the beginning of my new career, sales. SGDC: In the 1973-74 season you were playing with the Sherbrooke Beavers of the Quebec Junior Hockey “A” League when you were selected to come to the Saginaw Gears, tell us how that came about? KURT: Well my tenure in Sherbrooke was short, but the GM at the time told me if I did my job and worked hard he would find me a place to play if I was not drafted in the 73- 74 NHL Draft. Not drafted he said he had a friend by the name of Don Perry who was coach of the Saginaw Gears and that the team was in need of a physical player like myself. He said that I needed to go to camp and work hard, play my game and the rest would take care of itself. I came to Saginaws camp worked hard and made the team. SGDC: You were racking up the penalty minutes in Sherbrooke, how much do you think that influenced your move to the Gears? KURT: Believe it or not I was not a fighter when I played high school hockey, physical but not a fighter. I become one in a hurry in Sherbrooke if I wanted to stay there and play I needed to become an enforcer, so I learned in a hurry how to go about it. During my time there 35 games I racked up well over 150 minutes in penalties 15 fights and was earning a reputation as one of the QMJHL premier fighters. SGDC: From talking to other players, I’ve been told that playing on a French-Canadian team, if you are not “Quebecois” yourself is, at best a bit awkward and at worst insufferable because there is a tendency to keep you as an outsider- how was it for you? KURT: It wasn't bad at all, after the first game and my first fight they knew I was there to stay. The fans loved a physical game and fighting which I brought to them every game, so winning over my teammates and fans was a very easy transition for me. SGDC: What was your first impression of Saginaw and the Civic Center when you arrived? KURT:I was overwhelmed to say the least, I finally had arrived at place that was going to pay me for what I loved to do which was play hockey, it was as though this was what I had worked for my whole life and it truly was. It was an opportunity for me to continue to learn the game, be part of a team and continue to set my sights on making it to the NHL. SGDC: Mario Lessard started the season at the same time that you did, and he had been your goaltender in Sherbrooke- so I guess at least you knew someone when you got to Saginaw’s Wendler Arena. KURT: Yes Mario and I played together in Sherbrooke, and although he didn't speak english to well it certainly helped me knowing someone on the team. Also Stu Irving was from the Boston area and we became friends right away. SGDC: When you arrived, do you recall if anyone mentioned that the Gears had gone to the Turner Cup finals the previous season? KURT: You know I don't recall, they might have but it doesn't stand out in my mind at all. SGDC: Was your role as an “enforcer” outlined by the Gears, or was it just the way you felt would work the best to move your career ahead? KURT: It was something that didn't need to be said, I knew my role from the beginning. I wasn't a 20 goal scorer so I knew that I needed to continue to play physical and continue to make the best of my situation at every turn. If I wanted to get to the NHL I needed to be noticed and the way to be noticed was do what had become second nature. SGDC: This was the era of Dave Schultz, Phil Russell and Andre Dupont when enforcers meant ticket sales. So your role as an enforcer was not something unique, rather it was a critical element of hockey, correct? KURT: Yes it was and still is a critical part of the game a good fight can set the tempo of a game. People love to watch good fights in hockey and very physical games. If they took fighting out of the game I'm sure what the ticket sales would be. Back in the 70s and 80's you had all of the toughest players of the game and I fought many of them- Schultz, Russell, Jonathan and may more. SGDC: Of course with Gordie Malinowski and Dennis Desrosiers on the team, you fit in quite well. KURT: Exactly, I knew my back was covered with those guys, I never had to worry. They were both very reputable players who reputations that preceded them, so I didn't have to go about it alone. It certainly helped me a lot. SGDC: You were about 20 years old when you came to Saginaw- those must have been very fun days for you. I’ll bet you didn’t get homesick did ya’? KURT: Not really, I had spent the previous season in Sherbrooke so being away from home was part of the game. And the fans in Saginaw were great and always made you feel very special, they embraced you so you never felt homesick at all. SGDC: What were your favorite “haunts” or places to hang out in Saginaw? KURT: Larry's was a sports bar downtown that we used to frequent after practice so it was fun to head there with the boy's. I think there was a Chinese restraint called Rhodichers I know I didn't spell that right but I have some memories of going there as well. SGDC: I’ve been told that the biggest jokester in the locker room was Dennis Desrosiers- did he ever get you with one of his famed pranks? KURT: Dennis was for sure but to be honest I can't remember if he did, it has been so long. As a rookie you knew you were going to get, I remember it well, I got shaved, then the heat balm in areas I won't mention. It was all in good fun and was part of the game, once that was over you really felt you part of the gang. SGDC: Every team in the IHL that season (1974-75) had an enforcer or two, and you often went head-to-head with all of them, sometimes several times in one night. Fellows such as Carlo Torresan of the Muskegon Mohawks, Willie Trognitz of the Toledo Goaldiggers and Frank Beaton of the Flint Generals were often found on the other end of your fists. Did you ever come across any of those guys later in your career? KURT: I speak to Frank on occasion we are friends on Facebook. Frank is a great guy and he had a job to do just like I did. Interestingly enough he was shot about 10 years ago by some nut case in Alabama where he lives. It was a road rage incident where the guy pulled over as did Frank and the guy pulled out a 357 and shot Frank right there. I know he lost a lung and spleen and was critical for many weeks, but Frank being the fighter he is pulled through. Torresan was homesick speaking only french he wanted to go home and didn't last too long. Trognitz I don't know but Paul Tantardini, who I fought from Toledo, [died in 2006]. SGDC: That year that you were with the Gears was a great season as you guys went all the way to the Turner cup finals again. As I recall the playoffs were pretty rough with the Gears going down 3 games to 0 in the round with Muskegon, then fighting back to win four in a row and win the series. For a 20 year old kid, it must have seemed like quite a ride no matter where you were sitting. KURT: It was, it was very cool for me, we had such a great team back then. I didn't play that much but to be a part of a team that was able to do that was truly monumental and great series for the fans. SGDC: In the end of the 1974-75 season, the Gears lost in game 7 of the finals to Toledo, in the second home heartbreaker in a row. Where did that leave you career wise? KURT: I was disappointed as you might imagine, but there was a lot more hockey for me to be played. It was that summer that I was contacted by the Toronto Maple Leafs inviting me to camp that fall, so it was an exciting time for me. SGDC: Talk to us a bit about your career moves after you left Saginaw. KURT: Well, I went to the Leafs training camp that fall not knowing what to expect. During the camp I had a couple of fights so they Leafs could see what they had in me and it must have worked because after camp they offered me 4 year contract. After signing I was sent to Oklahoma which was their top farm team in the CHL. I played there for about three and half months and then got the call that I was going up to Toronto for a home game against the Capitals and the next night was the Flyers in Philly. In Philly I started a bench emptying brawl and fought everyone in that game, after the game the owner came down and asked me where my stuff was I told him in Oklahoma, and he said got get it your here for good. It was a memory I will never forget and my Dad was standing beside me when he said it. SGDC: I’ve heard that you, and a couple of the organizations that you played for had somewhat “different” ideas as to how you should be utilized as a player. Can you give us some details on the direction that you felt your career should be headed in verses how the people calling the shots thought you should be played. KURT: Well I was an enforcer that was my game, in the summer of 78 there was a trade between Leafs and the Kings I unfortunately was part of the trade and knew it wasn't good. The Kings were a mess at that time the GM George MaGuire was a drunk, he told me in day 2 of camp he didn't know why he traded for me. I thought “…this so-called organization is a joke compared to Toronto…” and I had a 3 year deal that they had bought, so I bounced around for a while. I loved playing in Tulsa and actually had a great year 17 goals and 20 assists so I had developed as a player and thought I might get a call up but that never happened so I bounced around after that year to a few clubs then called it quits in 80-81. SGDC: Still, you went from the IHL to the CHL and NHL and at the ripe old age of 21. That’s like a fantasy come true for any hockey player, but especially so for a kid from the US. Did it go to yer’ head… even for a little while? KURT: No not really I never forgot where I came from, I always had time for the fans and was grateful for where I was and what I had accomplished in a short time, it was a lot of hard work, dedication, commitment, attitude all the right things had to come together for me and they did and I was very grateful. SGDC: My research shows that you played 10 games in the Stanly Cup playoffs with the Maple Leafs in the spring of 1978. That has got to be an amazing experience beyond anything most us can imagine. The pressure, then advancing to the next round, the team getting closer and playing as a unit. Even if the team gets eliminated, it is still something most players never get to experience. Can you talk a bit about that? KURT: In 78 we ended up playing the Kings or Penguins in round 1 then on to the Islanders in round 2. It was a tough series and went 7 games the last game on the island. We had a great team and some great players Sittler, Salming, McDonald, Turnbull, at the end of regulation we were tied 3 - 3 I think, in overtime Lanny picked up the puck and beat Chico Resh to score the winner, you would have thought we won the cup after that game. We then faced the Canadians, who had been resting and waiting for us, we lost that series 4 games to 1 but beating the Islander was awesome. SGDC: Please tell me that you swiped a Maple Leafs jersey- because if I’d have had the chance I would have. KURT: Yes I have several jersey's from the Leafs and some memorabilia, great memories as well. SGDC: You did a tour with the Maple Leafs and I heard later the L.A. Kings. Is that correct? KURT: Yes, the Leafs first, then the Kings the Kings as mentioned above were a nightmare for me they were a terrible organization. SGDC: So did you find yourself playing for Don Perry again? KURT: No I never did, he was a tough coach and his tenure in the NHL wasn't very long. In the NHL you can't tell guys they have to fight, he did with Paul Mulvey and that was the end of his career. The things he got away with in the IHL you can't do in the NHL, it's a whole different world up there. SGDC: Give us some details on that. KURT: I wish I had some. SGDC: You spent about three years in the CHL and AHL, what were those leagues like? KURT: They were a lot of fun especially the CHL the weather was great all the time, the travel was not too bad and it was very competitive being one step below the show. I didn't spend too much time in the AHL, so I can't really address it. SGDC: Eventually you decided to hang up the skates and as they say “go do something else.” To some that may seem like an agonizing career choice to make, but I did it when I decided to get out of the airlines and it was easy for me ( I just tell folks that one day someone left the cockpit door unlocked and I snuck out when no one was looking). Tell us about that period in your life when you decided on a new direction for yourself. KURT: It was very difficult, I mentioned above about making the transition and how difficult it was. You play the game your whole life, no college to fall back on and then you go out into the real world and what the hell do you do??? It was real tough on me in many ways and in the beginning I struggled terribly. Fortunately I was able to make a connection about 2 years after the game and it all came together, but for some guys it never does. SGDC: I guess that brings us full circle in this interview Kurt. I recall back in the 1974-75 season I was one of those Civic Center ushers in the orange coats, and I not only stood in the arena and watched you play, but I watched the excitement in the crowd that you often caused. I’ve heard it said that for all of the fun that we spectators had during the hockey season, you guys had about 100 times as much fun- you just looked really serious while you were doing it. Kurt- thanks for taking the time to be here on Saginaw Gears dot com and thanks for the thrills you gave us back in the day with the Saginaw Gears. KURT: Wes, I want to thank you for reconnecting with me, it was an honor to do the interview I also want to thank all of the Saginaw fans who made my life special in many ways early in my career. I hope I gave them their monies worth every time I stepped on the ice. Also if anyone has a Facebook account I am there and if they ever want to befriend me that would be great. Thanks again for the memories!! !